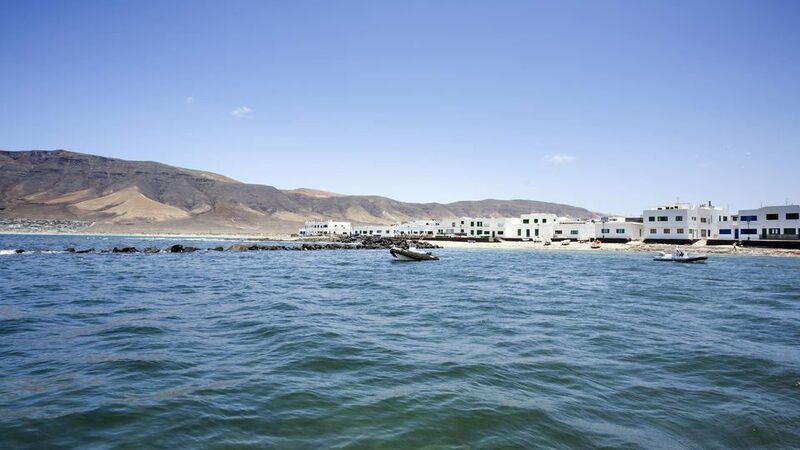 Making a name for itself in the tourism and water sports arena is Caleta de Famara in the north of Teguise. Although the village may appear sleepy, slumbering is the last thing tourists do here. Aside from the natural splendors, the exhilarating selection of activities keeps them awake. It certainly didn’t earn the label “European Hawaii” for no good reason. Famara boasts a long history that dates back to pre-Hispanic years. In fact, people unearthed many aboriginal sites here in the 1960s. Experts also believe that other aged structures still lay hidden within the stretch. La Caleta, however, is quite a young settlement. Before having inhabitants, the area only had stone warehouses for boats. 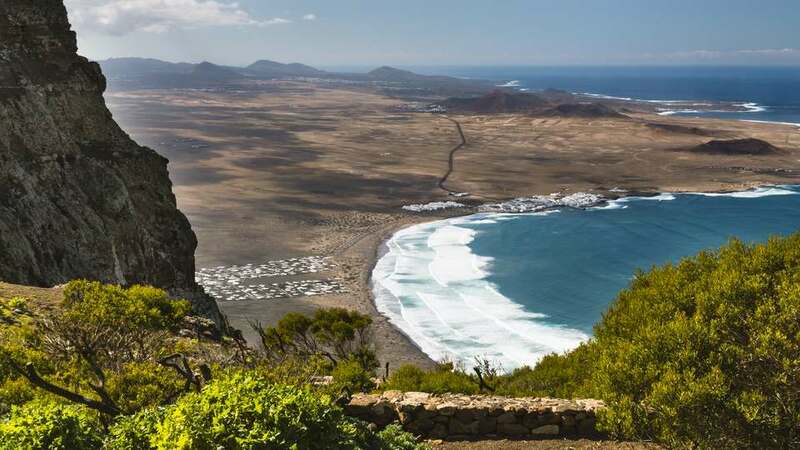 Then, in 1888, several families from La Graciosa and Soo moved here. By 1909, its scanty populace grew a little to twenty-five. They occupied its only three buildings which stood along twenty-four storage places. From a lovely secluded community, it then developed into a summer dwelling. To date, its most famous resident is no other than Cesar Manrique. He for sure created the most blissful memories in the little town as he chronicled with joy: “My greatest happiness is to recall a happy childhood, five month summer vacations in the Caleta and the Famara beach, with its eight kilometers of clean and fine sand framed by cliffs of more than four hundred meters high that reflected on the beach like in a mirror. That image has been engraved in my soul as something of extraordinary beauty that I will never forget in all of my life.” Perhaps these recollections were the force behind his lifelong dedication to the fusion of art, human, and nature. Enclosed by pure nature and still with unpaved paths, La Caleta indeed has that untouched feel to it. 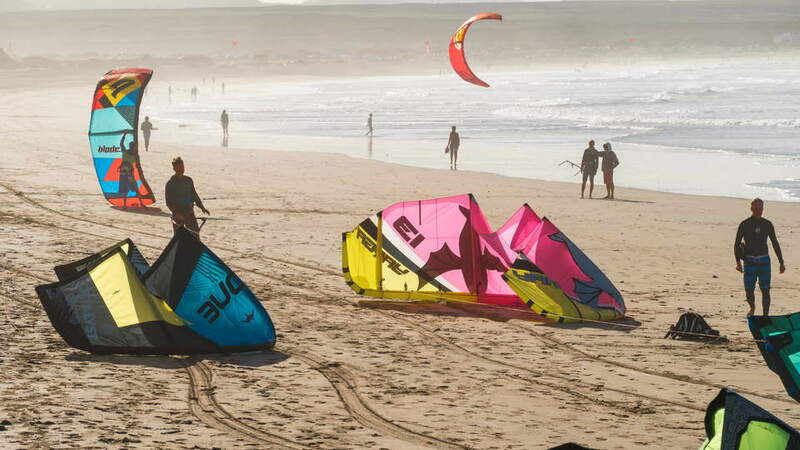 With the absence of business establishments apart from the surf schools, bars, restaurants, and grocery shops, holidaymakers can focus and relish the beauty of Mother Earth. As a matter of fact, this devoid of usual tourist spot features is one of the reasons why they love the sandy oasis. 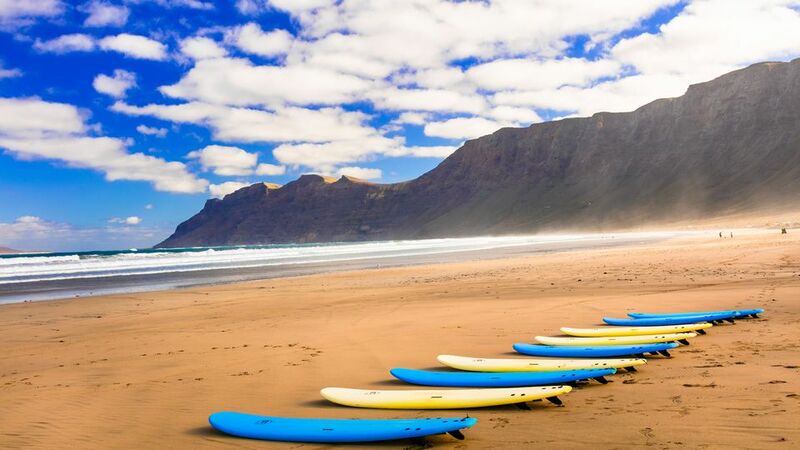 Famara is home to two stunning, pale golden sand beaches with powerful waves. On La Caleta’s right is the lengthy Playa de Famara. At six kilometer long, it is the largest beach on the island. A bit secluded and just as pleasant is Playa de San Juan on the left. Although its small in size, the surge of the waters in its small bay is as strong. Wave riders hail them as paradise as almost all types of surfing—stand-up surfing, kite surfing, wind surfing, and even body boarding—are welcome in their azure waters. In fact, Playa de San Juan is host to an annual professional surf competition. Needless to say, swimming is not always possible in either of the two. In Famara beach, people can observe the flag to make sure it’s safe to swim. Red means a no-go, yellow is to do so with caution, and green is a thumbs up but only near the shore. Walking is a gratifying and relaxing activity when in La Caleta. Although not as thrilling as indulging in water-sports, it is anything but dull. This side is one of the most breathtaking in all of the island and the archipelago. 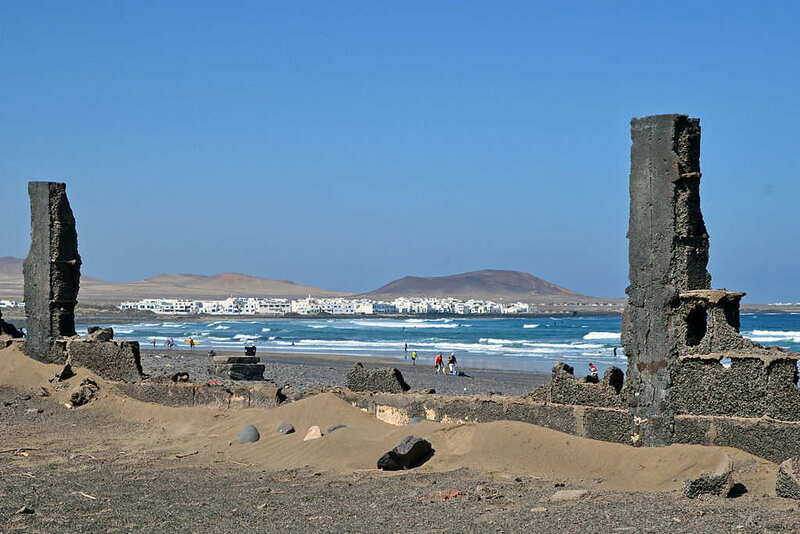 Dominating the whole west coast of Lanzarote is Risco de Famara. Many cliffs, including the isle’s highest peak, and viewpoints, Mirador del Rio being the most popular, are all here. From La Caleta and the seaboard, it looks like a roaring and towering wave-like form is majestic. Of course, there’s also the never overlooked blue sea, with La Graciosa visible from afar. Eager to meet Famara’s golden sand is the Atlantic’s impressive rolling waves. Its endless crashing waters create soothing music that accompanies vacationers all day every day. Beyond the bay, the vast azure wonder bears the reflection of the giant Risco. Together, they make the walks a pure bliss and unforgettable. Those who prefer to go by public transport are in luck as bus line 20 goes from Arrecife to La Caleta. With a couple of stops along the way, the whole ride would take around 45 to 60 minutes. Please note, though, that it is only available on weekdays (except holidays), five times a day from 06:30 AM and 21:30 PM. From the capital, go through LZ-1, take LZ-10 after Avenida Campoamor, then Calle el Guirre also known as LZ-408, and finally LZ-402 all the way to La Caleta. La Caleta and nearby Urbanización Famara have plenty of bungalows or apartments to offer. Finding a rental that fits one’s requirements and budget should not be an issue at all. Casa Dominique offers three villas set in a 10-acre beachfront estate. Also within the property is an outdoor swimming pool and a central farmhouse dining area. On the other hand, the two-bedroom Apartamento El Pueblo has a balcony with sea views. For tourists who wish to stay in Urbanización, Villa Oceano comes highly recommended. It has three bedrooms and useful amenities which includes a fully-equipped kitchen. For those in La Caleta to learn how to surf, there are surf schools that also offer accommodations. Among those who have established a trusted name are Clandestino Surf Adventure, ZooPark Famara, and Red Star Surf & Yoga Camp. Great food, along with breathtaking vistas and fun activities, makes a vacation unforgettable. And, of course, La Caleta aims to not be under piles of other holiday memories. So far, thanks to its few but worthy of praise restaurants, it’s able to do just that. Beach vacations are an absolute time for seafood. Fresh, tasty, and lots of it! For this type of dishes, Restaurante Sol and Costa Famara stand out. Diners of both restaurants rave about their grilled octopus and fish offerings. It’s tough to choose between the two, so do try both. When craving for a burger, the simple El Sibarita is the best and tastiest option. Aside from the usual types, they also have vegan and chicken burgers. Their delicious selection of Asian dishes is also a hit. What’s more, they serve generous portions and have a range of must-try sauces. Caleta de Famara can’t please everyone as it lacks some features others require. No loud party music, grand hotels, or large shopping complexes. Swimming isn’t even something it can offer all the time. It is, however, one of the few places that looks as amazing, if not better, as they do in pictures and postcards. Nothing here, aside from the whitewashed houses and structures, is artificial. Risco de Famara is genuinely soaring high and shaped like a giant tsunami. The Atlantic is a vast, breathtaking blue and surfers can’t stop praising its waves. It is a village where tourists can feel the sand in every place not under a roof or within walls. For those who want uncomplicated and natural, La Caleta is calling.